My Amateur Call sign is VK5KC. I was first licenced in 1969 as VK5ZMO. Later after passing the Morse Code I changed to VK5AMK. 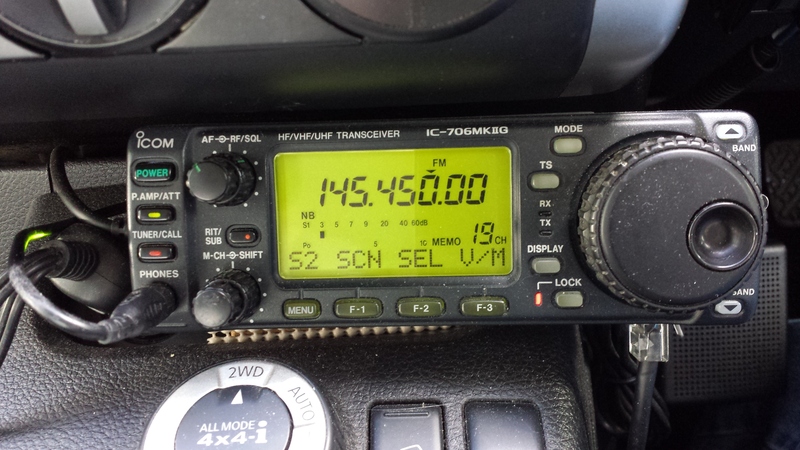 When 2 letter calls were offered I changed again to VK5KC. This call was originally held by Ken Cahill with whom I worked at Telstra. He was also a mentor in my radio hobbies. How do you fit an Icom IC706 in an Xtrail? After probing the firewall for some days and not finding an easy way through I took 2 lengths of coax to the local auto electrician and asked him to get 12v power and 2 lengths of coax into the cabin. This went alongside the main wiring loom. It meant his taking out the battery, air cleaners and glove box to allow access. Fortunately the radio has a remote head which can be mounted on a small bracket in the console just in front of the gear change. The remainder of the radio fits nicely under the passenger seat with an LDG tuner on top held with a velcro strap. The whole lot sits in an open top plastic box to avoid kicking by the rear passenger. One coax feeds a base on the drivers mudguard for HF operation and the other feeds a dual 2m / 70cm antenna on the Rhino rack on the roof.